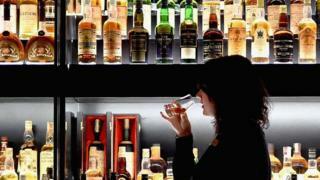 Image caption Scotch whisky exports reached an all-time high in 2018, according to industry figures. The Bruichladdich whisky distillery has unveiled plans to run entirely on renewable energy within the next five years, as part of a £20m investment. The distillery is now the biggest private sector employer on the island of Islay, and wants to use energy more responsibly. Meanwhile Bruichladdich boss Douglas Taylor said Brexit uncertainty could cause short-term complications. But he said it would not derail its potential for longer term growth. Mr Taylor told BBC Radio's Good Morning Scotland programme: "Because we're going to put on-site maltings in place, we're going to increase energy use, and as a business, we believe we should be looking at renewable energy." The distillery is currently looking at tidal, water turbine and biomass projects to run its operation in future. "It would be a dream to see some of the smaller-scale elements like biomass or water turbines coming in the next two years," said Mr Taylor, adding: "I think it's probably within five years we'd be looking to make a full switch." Bruichladdich, which is owned by French company Remy Cointreau, has seen £22.8m investment in the last five years, and its expansion could see a similar level of investment again by 2024. It came after it emerged that Scotch whisky exports hit a record high in 2018. Meanwhile, Mr Taylor said Bruichladdich, which employs 80 people, had taken steps to counteract any problems with Britain's departure from the EU, which has become bogged down by delay and controversy. He did not go into detail on the contingency plans, but added: "We've got a business that's split between America, Asia and Europe. Europe's a big part of that. "It won't derail the growth potential that we've got, but it may make things more complicated in the short term. "We certainly have huge advantages in building our business in the Americas and Asia, and we'll continue to do that."